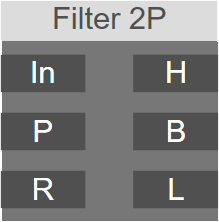 2 pole resonant multimode filter. A multimode biquad filter with highpass, bandbass and lowpass outputs. The cutoff frequency is calculated on a logarithmic pitch scale received on the 'P' input.